Seine-boat and crew "pursing the seine." The net has been rowed around the mackerel school to entrap it, and now the fishermen are hauling it in. The dory on the left pulled the seine around the school while the net was fed out. Once they have the seine pursed up, the schooner will come alongside, hoist the net further, and dip out the mackerel. Diagram showing the different sections of a purse-seine. The seine is spread around the mackerel school by a boat. These seine boats were rowed before internal combustion engines, and are now powered. 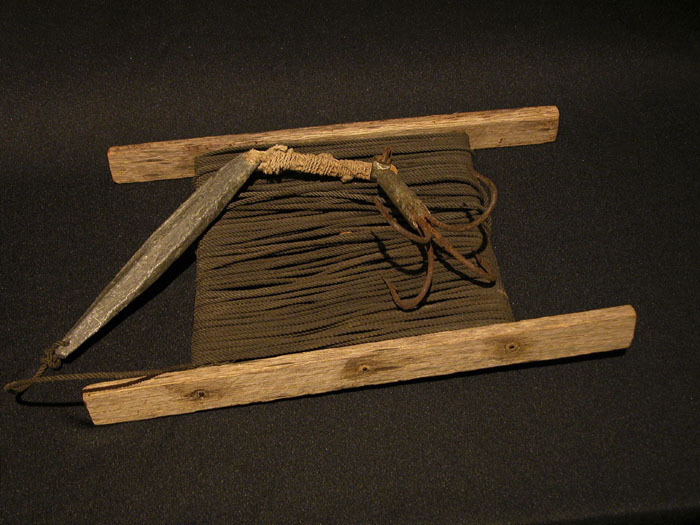 Purse seines are used for mackerel and herring. 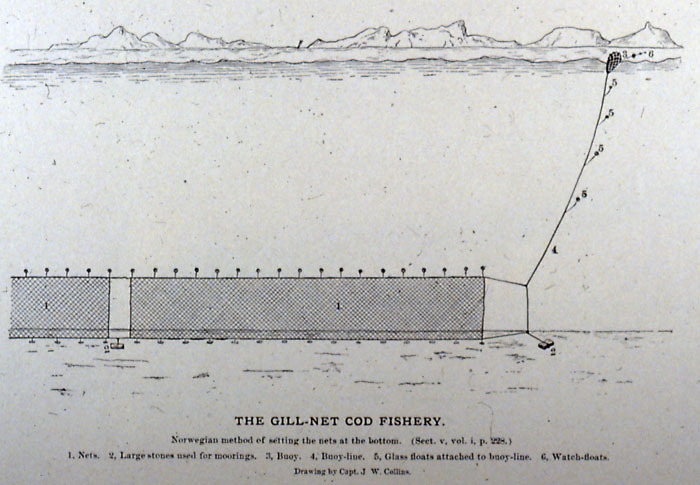 Norwegian method of setting the nets at the bottom. 1, Nets. 2, Large stones used for moorings. 3, Buoy. 4, Buoy-line. 5, Glass floats attached to buoy-line. 6, Watch-floats. In 1885 this was new technology in the American ground fishery which was still based on hook and line fishing. Dory and crew setting cod trawl-lines on the Bank. 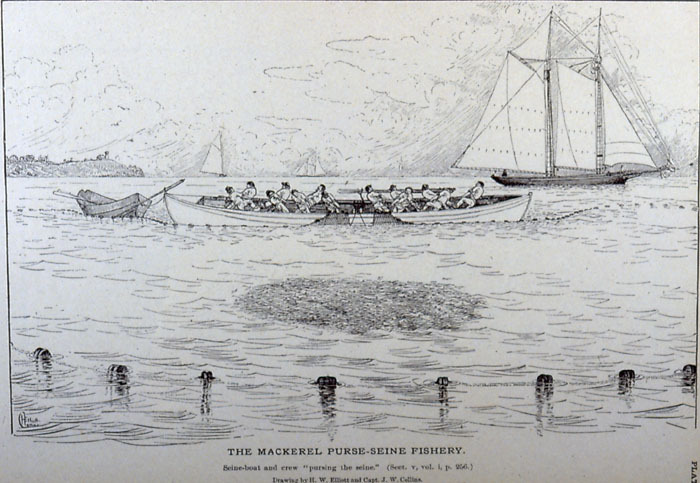 From the latter half of the 19th century to the 1920s, this was the most productive form of hook and line ground fishing, finally superseded by power vessels towing otter trawl nets. Long lines are made up in tubs with baited hooks on short lines called snoods attached every six feet. The trawl line would be marked by buoys at each end and anchored to the bottom. They could be half a mile long. 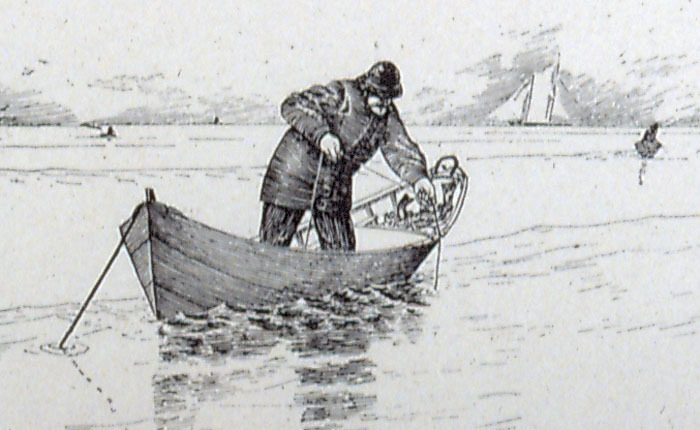 After setting trawls the dory fisherman would run down their lines taking off fish. Trawl tub with line and two trawl anchors. When the line is stowed properly, the hooks hang over the top edge of the tub, so that they do not get entangled with the line. 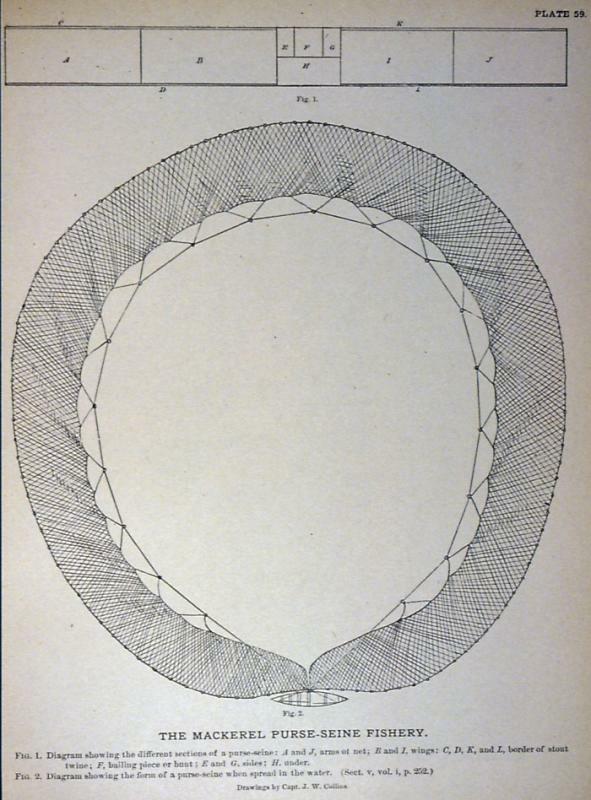 Trawl line is tarred cotton line, often about 1/4" in diameter. Gangings, or leaders, are spaced every fathom, each with a hook at the end. 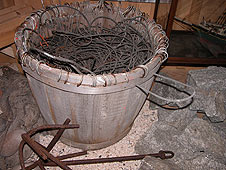 Tubs were often made from barrels cut in half. Hand-line dory cod fishing on the Grand Bank. The fishing schooner would anchor and launch a fleet of dories, which let the fishermen spread out from the ship. A fisherman could tend several handlines. 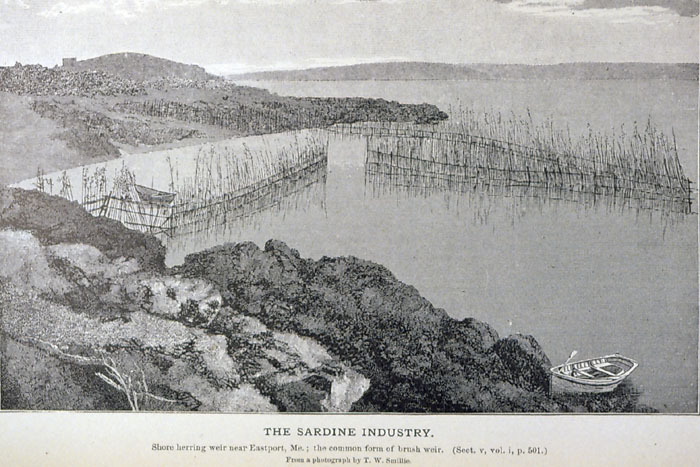 This image is from G. Brown Goode's The Fisheries and Fishery Industries of the United States, 1884-1887, Section V, Plate 24. 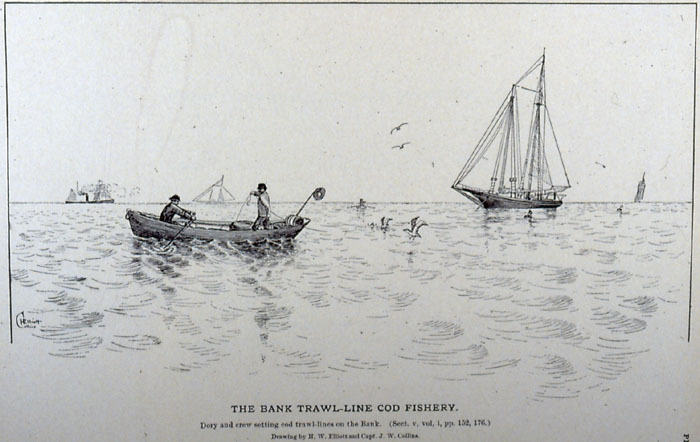 The book can be found on line at: http://celebrating200years.noaa.gov/rarebooks/fisheries/welcome.html. 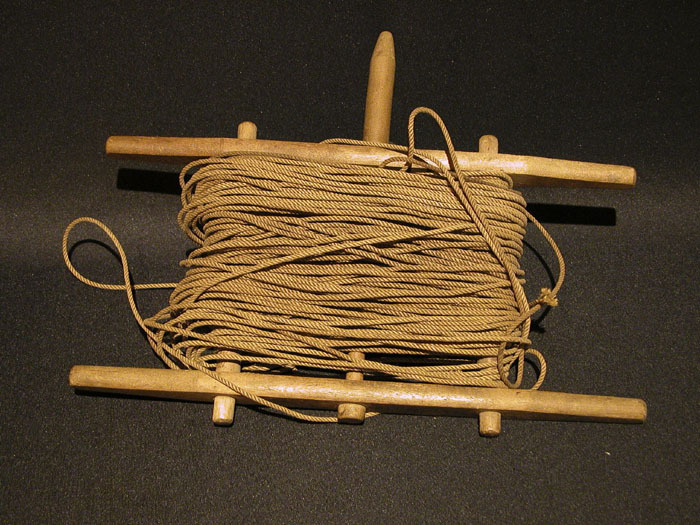 Fishing line, including reel, sinker, and hooks, for cod fishing. 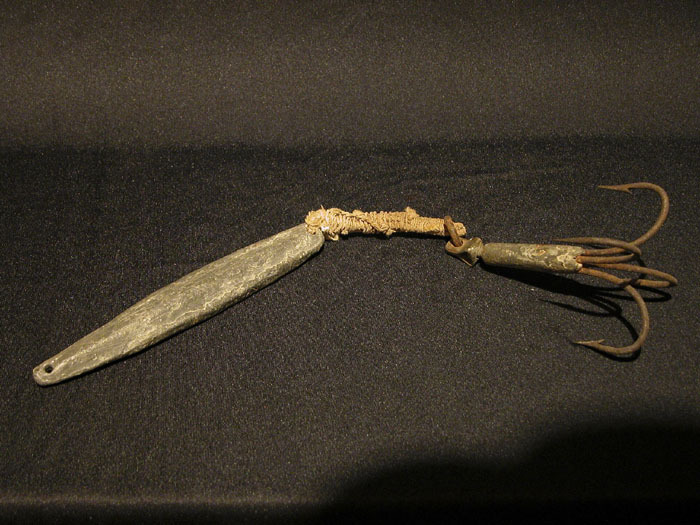 Used by Boothbay fishermen in North Atlantic fisheries in the 1920s. This line was tarred linen or cotton. One of the few left of the tens of thousands of these handlines. 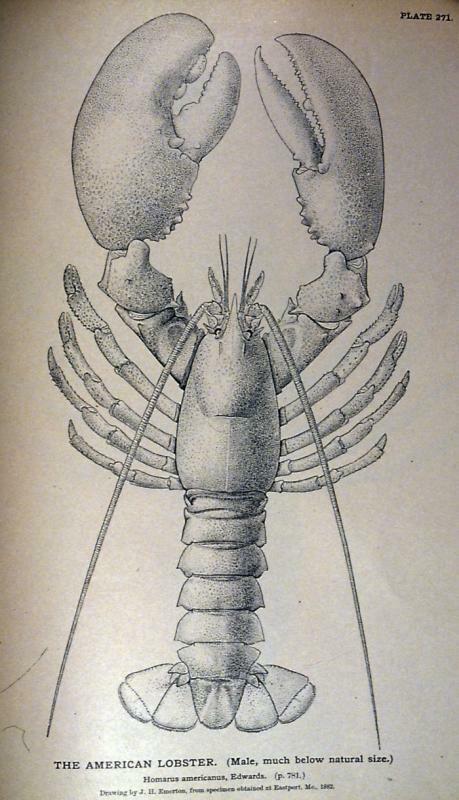 The American Lobster, Homarus americanus. This image is from G. Brown Goode's The Fisheries and Fishery Industries of the United States, 1884-1887, Section I, Plate 271. The book can be found on line at NOAA Celebrates 200 Years of Science, Service, and Stewardship. Atlantic Salmon, Salmo salar. Once a highly valued commercial fish, the Maine Atlantic Salmon was declared an endangered species in 2009. Salmon are raised in aquaculture, but many problems, ranging from disease to ecological issues like impact on feed fish and fish pen effluent, are creating difficulties for farm raised salmon.